What do you love about MPA? I love that I get individual feedback from my teachers on assignments. How are you encouraged to dream big and do right? When I see classmates working hard and challenging themselves around me, it makes me aspire to be my best self. If you have attended another school, how has your experience at MPA been different? I came to MPA in kindergarten, so I don’t recall exactly! What would you tell a family considering MPA? It’s a great community and I know everyone so well. For example, on the Deep Portage overnight trip last year, our grade got to know each other even better. There was a moment when we were in groups and I had new students that I didn’t know as well in mine, plus some teachers that our grade was just getting to know, yet everyone was themselves with each other. In what ways has MPA prepared you for life? It has taught me so many life lessons around how to be an ethical person. What do you dream for yourself in 20 years? At age 36, I’d like to be playing professional baseball and raising a family. After that, I’d like to have a good friend group and still be interested in lifelong learning in whatever I do. 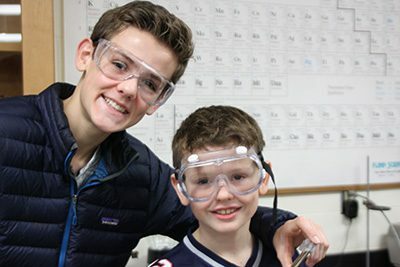 JD is pictured with his younger brother during a pairing activity. The older students were showing the younger students how to make icicles in the chemistry lab. Mounds Park Academy, a PreK-12 private school in Saint Paul, is currently accepting applications for the 2019-20 school year. For more information about admission and to schedule your tour, visit moundsparkacademy.org/admission. We look forward to getting to know your family!